Nylon folding flyer in pouch with matching or contrast trim. Chose from existing colours (subject to availability) or contact us for other current colour availability. 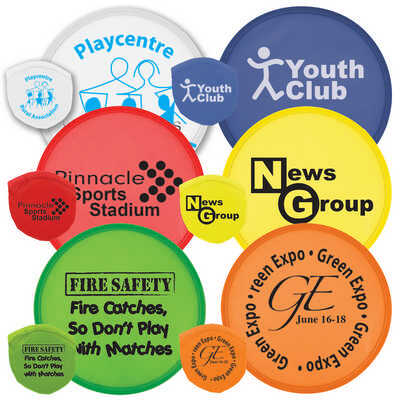 Colours - Black, Blue, Green, Light Blue, Neon Green, Neon Orange, Neon Pink, Neon Yellow, Red, White, Yellow Size - Flyer: 250mm Diameter, Pouch: 95mmL x 95mmH Decoration Area(s) - Screen Print : Front - Circle 180mm Diameter, Pouch - Circle 75mm Diameter; Sublimation Print : Front - Circle 180mm Diameter, Pouch - Circle 75mm Diameter. Price includes : 1 Col 2 Pos Print (Flyer + Pouch) Air Freight. Setup is included.